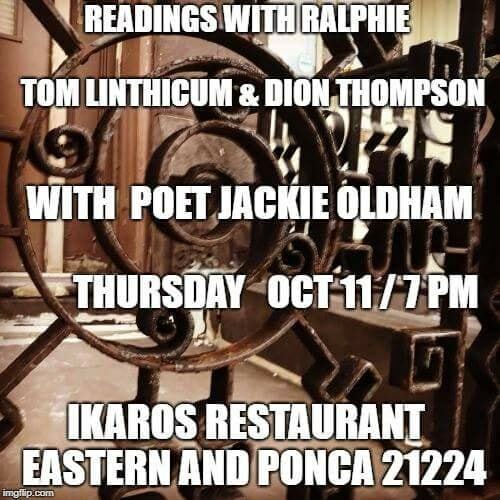 It was an honor to be the featured poet Thursday night at this special READINGS WITH RALPHIE event, especially since it was my first-ever poetry reading! Ralphie (Rafael Alvarez) hosts numerous readings by a wide range of authors in Baltimore throughout the year. But this event was a fundraiser for http://www.mothersetonacademy.org, a middle school whose goal is to prepare under-served students to attend elite Baltimore high schools, both public (City, Poly, Western) and private (Catholic and others). Tom Linthicum and Dion Thompson, former Baltimore Sun colleagues of Ralphie who have published books in connection with their Episcopalian faith, read excerpts from their books. Another of Ralphie’s friends provided live original music. A light Greek meal (with dessert and coffee) was enjoyed by all who attended, and proceeds from the sale of Deviled Eggs (on a table filled with several varieties of this staple dish) were also donated to the school. Ikaros Restaurant is a beautiful and storied Baltimore treasure, located in Greektown/Highlandtown.